This article is written by Philipp Lenssen as part of the Blog Swap with Seth Finkelstein – Seth's article on 10 Things You Might Not Know About Censorware can be found at Philipp's blog. 1. Google query syntax underwent some subtle changes over the years. Not too long ago, you couldn't enter more than 10 words into the Google search box. Or to be more precisely, you *could*, but subsequent words were ignored. I bet the Google founders were thinking "10 words ought to be enough for everyone," and mostly there were right – but for some advanced uses, especially with the Google Search API, a little more is helpful. Then, a while ago, Google increased the words limit to 32 words. This is probably OK for a few more years! Another operator changed its functionality during the years; a couple of years ago, you could only query Google for [site:something.com], but not [site:something.com/something/]. Today, you can add folders to the site operator. 2. Google itself was Beta. These days, everyone puts a Beta tag on their 2.0-ish web app. 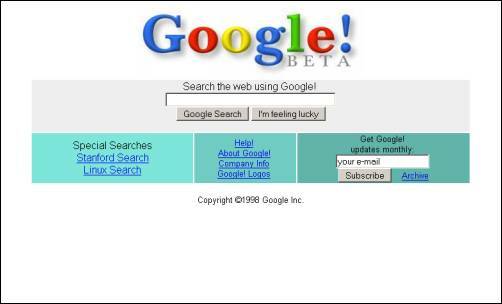 But did you know back in 1998, when Google launched their search, it was also in Beta? Take a look at a copy stored in the WayBack Machine to see it. Be aware the page might look quite ugly by today's standards... heck, it was probably ugly even back in 1998 (then again, so was my homepage in 1998!). 3. PageRank more than 1-10 – maybe. While no one outside Google knows for sure, it is often speculated that Google's PageRank value – the "authority rank" (or quantity of backlinks which themselves receive lots of backlinks) – is a much more precise number than the plain 1, 2, 3... 10 values. A float, not an integer, if you will. So, for example, if you're looking at a site which shows a PageRank 8 in the Google Toolbar, its internal PageRank may be something like 8.355 (or however precise Google's number is). But we don't know for sure – maybe Google's algorithms prefer speed over quality when it comes to the recursive PR calculations of billions of pages. This calculation might not be a breeze even for Google's 10,000 - 200,000 computers (that's another number we can't be too sure of outside of Google). 4. Google's co-founders didn't like each other in the beginning. Like most schools, Stanford invites potential recruits to the campus for a tour. But it wasn't on the pastoral campus that Page met Brin – it was on the streets of San Francisco. Brin, a second-year student known to be gregarious, had signed up to be a student guide of sorts. His role that day was to show a group of prospective first-years around the City by the Bay. Page ended up in Brin's group, but it wasn't exactly love at first sight. "Sergey is pretty social; he likes meeting people." Page recalls, contrasting that quality with his own reticence. "I thought he was pretty obnoxious. He had really strong opinions about things, and I guess I did, too." "We both found each other obnoxious," Brin counters when I tell him of Page's response. "But we say it a little bit jokingly. Obviously we spent a lot of time talking to each other, so there was something there. We had a kind of bantering thing going." 5. Google has 16 official blogs. 6. Google self-censors in several countries. You heard about how Google self-censors in China (e.g. human rights sites top-ranked by Google in other countries are missing in Google.cn). But did you know that Google showed censored search results in other countries for years, sometimes even without showing a disclaimer that something was missing? In Germany and France, that was the case. "In response to a legal request submitted to Google, we have removed 260 result(s) from this page. If you wish, you may read more about the request at ChillingEffects.org." Google received complaints prior to March 2005 about URLs that are alleged to be illegal under U.S. or local law. In response to these complaints, one or more URLs that would have appeared for this search were not displayed. In other words, Google is not censoring this out of their own belief, but by following government requests. Now what's ety.com anyway, except being one of the many censored domains? A quick glance will show it's some kind of stupid Nazi propaganda site, illegal by some country's standards. But you know what Voltaire said... "I may disagree with what you say, but I will defend to the death your right to say it." 7. Google stopped counting their index size. Today, when you want to find out about the Google index size, there's a workaround though: search Google for ["* *"] – that's a good estimate. Right now, it's displaying 25,270,000,000 pages. In a direct comparison, when we search for "the" on both Google and Yahoo, Google shows a couple of billion pages more. Then again, these numbers are hard to verify – Google only lets us see the first 1000 results for each query. And in the end, who wants to see more than that anyway? Most people don't even go beyond the first 10 results, and rather adjust their search query instead! 8. The Google API may offer over 1,000 requests. If you're a developer utilizing the Google web search API, and you need way beyond the 1,000 requests per day Google offers by default, here's a tip: you can email the Google API support and request more hits for your API key. Depending on your projects and traffic needs, which you will have to outline, Google just might grant you the request! 9. Google comic book search. 10. Google Writely is a multi-user chat. OK, so Writely – which Google recently acquired – is not really a chat, but an online word processor. However, by inviting others to your Writely document, you can group-edit any document... and see the changes by others merged into the document as you type! This feature allows you to chat with a group, and you can have fun with positioning text on different places on the screen, wiki-editing what others wrote, or adding colors and images. Some of these things are pretty basic, but a few were wicked interesting. A few more official Google blogs. (Point 5 above). That makes it 23 official blogs for Google. You forgot to mention that Google regularly screws website owners out of money honestly earned through thier Google Adsense program. My site, http://www.SolePM.com, started making lots of Adsense money when we finally figured out how to do effective marketing for the site. Our traffic spiked, and in turn so did our Adsense profits. Soon after we were turned off and money being held for that month...nearly $500 was not given to us. Screw Google, Adsense, and Adwords. In regards to the search for [site:ety.com], Google US may show that it can return 9,000 search listings, but, in fact, it will only show 903 listings before giving the omitted-due-to-similar-results message. So, on the basis of your own problems with google, you think that it regularly screws people out of ad money? I expect hundreds of millions of sites use google ads, this is a very isolated problem that just happened to hit you. Adsense payment problems aren't isolated to his issue. Many, many people have reported getting stiffed and with no recourse to recover their earned money nor explination of why it occured. Check the internet. Google it! You incorrectly quoted Voltaire above. It was not Voltaire who said "I may not agree with what you say, but I'll defend to the death your right to say it." That was Denis Diderot, and this is often miscredited. #11 Did you know google is the next microsoft? Thanks for the tip off about the 10 word limit being raised to 32, I hadn't noticed that. That used to drive me nuts when trying to do more complex queries. The pagerank of a page is a probabilistic value, meaning that the sum of pageranks on all pages will always be equal to 1. With this in mind, it's not possible for a page to have a pagerank of 8.355. 0.8355 would be valid, maybe, if the page in question was the most authoritative and popular on the internet, but never 8.355. About the number of computers Google has: An anonymous source told me that it is now over 1 million. Not 100,000 as was previously believed. "That was Denis Diderot, and this is often miscredited." It's not Denis Diderot, it's a little-known writer, Evelyn Beatrice Hall. Congrats, Seth, you're on Reddit. Lots of people have been screwed out of their money by google. Not only does Google NOT pay you when you generate real genuine traffic, also they cancel your account with no way to return to AdSense. And yes, no explanations given. I didn't know that google allows more than 10 words now! Thats good news. I used to be very annoyed at the previous limit. If you don't like Google AdAsense, don't put it on your site!! Explanation is click fraud. If it was you paying for the click, you would want to know they are genuine. Interesting post, thanks! As a web designer, it pays to keep an eye on what's going on at Google....these tidbits make it fun! I understand that Google's- as well as other company's programs- might well be concerned about fraud. After all, we all know it is rampant, we see it everywhere. However, I would suggest that what Google should in that case is initiate a transparent fraud investigation program, perhaps in cooperation with law enforcement. They should give people their money and then investigate and perhaps sue (or criminally charge)offenders if that is indicated. Either that, or they should lobby for the creation of laws allowing them to withthhold funds in suspect cases, pending the outcome of a thorough, transparent, and time limited investigation. Time limitation is important, to prevent this provision from being abused. That may be a legal way to do it, but I'm still not sure it's ethical in my book. What Google is alleged to have done is certainly not ethical or legal. If this is happening, and enough noise is made about it and light cast upon it, any company so engaged should feel pressure to change. That presssure would come from the press (hopefully), the marketplace, and from the offices of attorneys general around the country. At least that's how it should work. With the corporatists in power in our government today all bets may be off. Please be sure to vote this fall. Google is Google. There's really nothing you can do about it. Like it or not. But you can't sit here and complain about it when you still continue to use it. We know it's not perfect. If you don't like the way they do things don't continue to refer back to them. About Google not gicing people their money; it's not cool. Something should be done about it. Much love. If you know it wasn't Voltaire, can I ask why you've not corrected the article? And there are More Google Search Tools that you did not know about. if you type in [site:ety.com] into google.co.uk you don't get anything - and no disclaimer. Many people don't realise that the order of the search words is important. The Google Beta one was fasinating. I guess everything they do is some type of evolution even themself!